We've come to the end of our tour around Disney's Hollywood Studios and we're just about at the end of my tour around each and every land in all four of the Walt Disney World theme parks. It's been quite a long journey and, as always, it's been quite a lot of fun uncovering what each land has to offer. As I come to the end of Disney's Hollywood Studios, my least favorite Walt Disney World park, I have to say that sometimes I hate putting this park last on my list. There is a lot of magic to be had in Hollywood Studios. Star Wars, Muppets, Indy, Fantasmic, The Tower of Terror, Walt Disney Presents; these are all things that rank pretty high on my all-time Disney favorites list. I still have never cared for the whole "behind the scenes of the movies" thing that the Studios pushed in its early days. As the park transforms into something else, however, that label is pretty much being cast aside, and I have no qualms about that. I'd still love to see the giant ABC billboards go away for good. I'm out and proud about being a Grey's Anatomy lover, but when I'm wrapped up in the magic of Walt Disney World, a huge Grey's billboard will pop my bubble anytime. I get why they do it, but it doesn't mean I have to like it. Something I do like about Disney's Hollywood Studios is the recent addition of Toy Story Land. On June 30, Disney did something that they rarely do, they unveiled a brand-new land in one of their theme parks. The four hour waits just to get inside Toy Story Land have subsided, and thank goodness because I'll have no part in that. 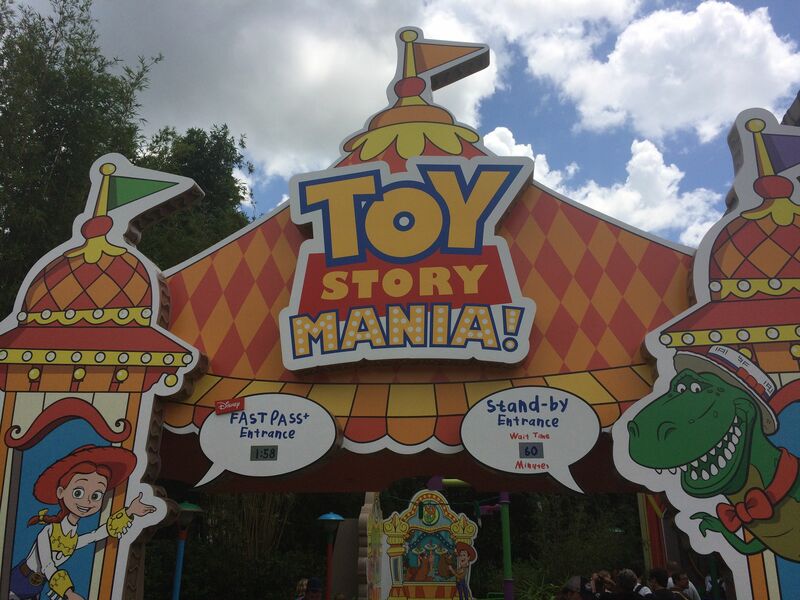 On our last visit just a few weeks ago, we couldn't wait to get back to Toy Story Land and see what Disney and Pixar had in store for us. I had read a lot and had heard some opinions from people I respect, but I needed to see it for myself in order to give it the whole Top 5 treatment. I've been a big fan of Andy's toys ever since the film's debut back in 1995. At the time I was working in production management at VH1 and we all received special invitations to a screening of something called Toy Story at the old Guild Theater in New York's Rockefeller Center. Most of us had never even heard the word Pixar before that evening. Some had read about the movie, but all most of us knew was that this film was supposed to be a big deal when it came to animation. We were all blown away by what we saw on the screen that night, and little did we know that we were witnessing the birth of cultural icons. Since then, it's hard to imagine a time without Woody, Buzz, and the gang. Every time you ever see any type of montage showcasing the history of the movies, animation will more than likely be represented by Mickey Mouse, Snow White and the Seven Dwarfs, and a scene from Toy Story representing the birth of the 3D animated film. Pixar's first full length animated feature film is a true milestone in the history of cinema and its appeal to new generations of fans over the years never seems to wane. We got to visit Toy Story Land twice on our eight-day trip last month, once in the afternoon and once late at night, two very different experiences for sure. We couldn't wait to get in there to check it out. What did I like best? 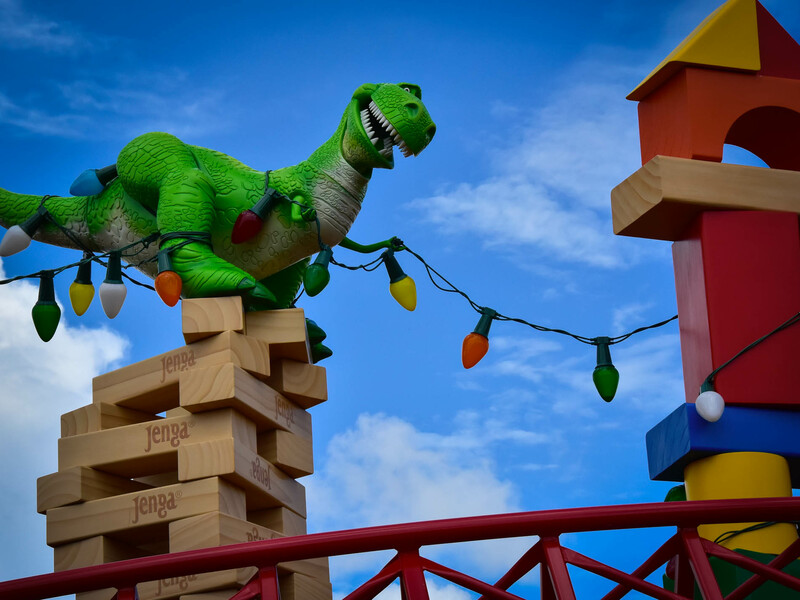 Let's find out with my Top 5 things to see in Toy Story Land at Disney's Hollywood Studios. I'm going to say right off the bat that I did not, in fact, eat at Woody's Lunch Box. The menu looked good enough. Grilled cheese and tomato soup certainly fit the whole theme here, but we weren't there during any meal times. However, it's not the food that I was admiring. 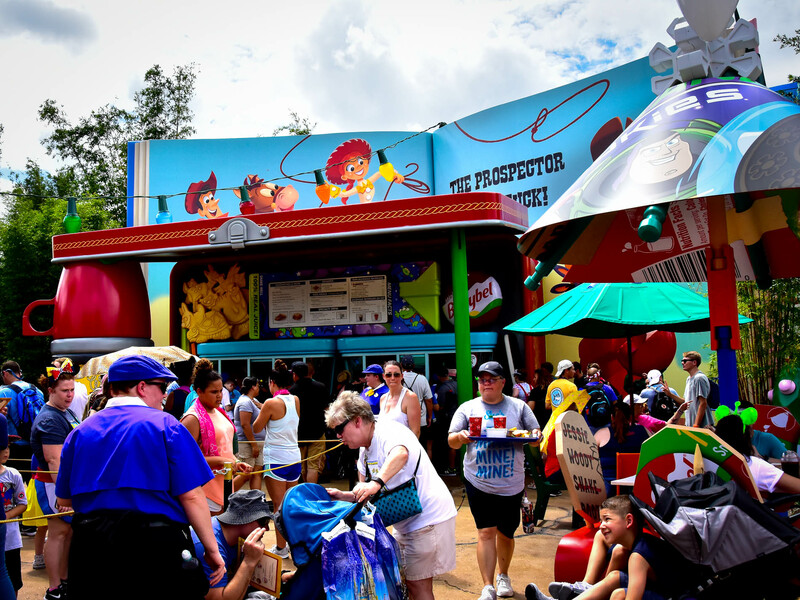 It seems a bit chaotic in this photo because it is in the first few days of opening, but Woody's Lunch Box is the place to grab a bite to eat in Toy Story Land. Photo by Bonnie Fink. As someone who went to school with a metal lunch box and thermos—mine was from the TV show Emergency, and yes, I still have it—I seriously appreciated the idea that Andy turned his lunch box and thermos into a place for his toys to get a bite to eat. The tabletop that's actually a note from mom; the other table and chairs shaped like Babybel cheeses; and the carrot and celery sticks that are part of the counter all pull the idea together beautifully. It's a brilliant design and I loved seeing it. Hopefully next time I'll try the grilled cheese. Disney's big at slipping references just about everywhere in the parks and resorts as well as in their animated films. This refernce was one I didn't expect to find in Toy Story Land though. Andy built Toy Story Land completely out of his toys. The whole place looks like it was built with K'nex, Scrabble tiles, cardboard boxes, Tinker Toys, and building blocks. 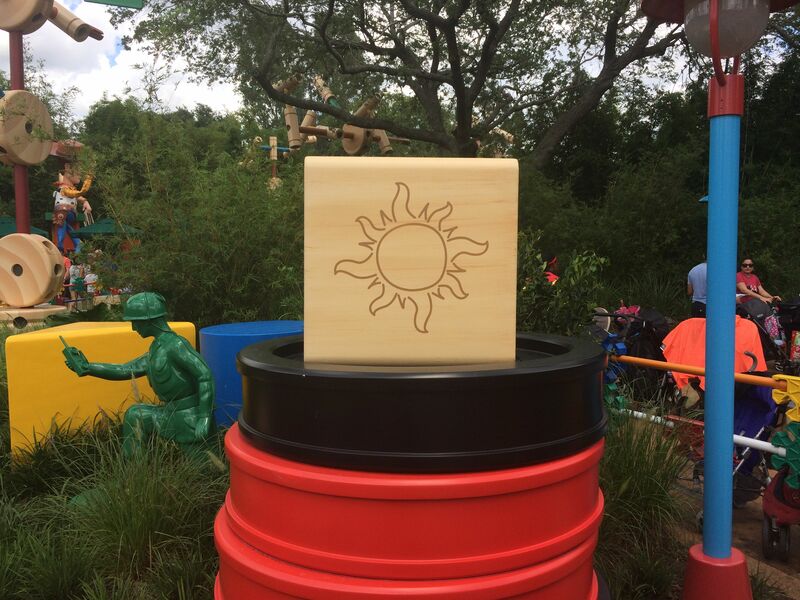 Near the main entrance to Toy Story Land we spotted one particular block with this fairly obvious Tangled sun emblazoned on one side. A wonderful "Tangled" reference appears on one of Andy's blocks in Toy Story Land. Photo by Chris Barry. There are Hidden Mickeys in Toy Story land for sure, but I didn't expect a hidden Tangled reference. That was a surprise from the Imagineers and I was thrilled when one of my traveling crew spotted it and pointed it out to me. Thanks Laura! If not for your keen eye I'm sure I would have missed it. I've always loved Toy Story Mania. Judging from the consistent high wait times over the years since its opening, it's safe to say I'm not alone. One of the best parts of the whole experience is the queue. It's impossible not to get nostalgic as you meander through the queue surrounded by the toys and games of your childhood. 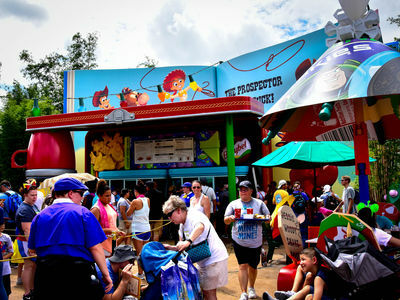 The Imagineers upped the ante when they moved the entrance from Pixar Place into the new Toy Story Land. 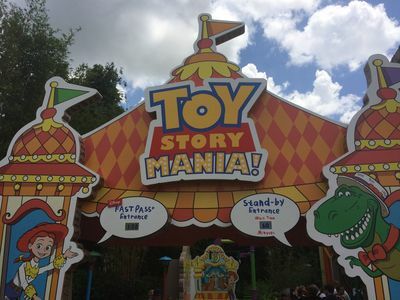 The new entrance to Toy Story Mania now resides within Toy Story Land itself. Photo by Chris Barry. There's even more to look at now including a Bo Peep game created especially for this line where your job is to, what else, help Bo find her sheep. It's very cool to see Bo Peep reimagined as her own game piece. I love what they did to an attraction that was already one of the best things in Walt Disney World. Walt and his original team used to call that plussing and it's great to see that they are still honoring that tradition. I need to admit up front that I wasn't expecting much from Slinky Dog Dash. When I first saw the designs, I thought it obviously looked cool, but I was convinced that it would just be a kid coaster, albeit longer. Did we really need another Goofy's Barnstormer. Kind of like Triceratops Spin that's just Dumbo with dinosaurs. Was this going to be the Barnstormer themed to Toy Story? Happily, that answer is an emphatic no. I'm not, in any way, suggesting it's Everest or Space Mountain, but Slinky Dog Dash is a ton of fun and stands out on its own as a unique coaster experience. Crazier than a kid coaster but not too crazy to scare people off. The Slinky Dog Dash rounds the corner after bounding through the camel humps. This is on the second part of the ride, after is launches from its second launch point. Photo by Bonnie Fink. We had a FastPass for it and were literally next to go on the ride when one of those lovely Central Florida summer storms blew in and they halted the ride due to nearby lightning. The ensuing monsoon kept us waiting in there for just under two hours. I never thought I'd wait that long for anything, but it was torrentially raining and we were covered and dry where we were, so we figured we'd keep hanging around until they reopened. Plus, the cast member team there was just incredible! They played games with the kids. They did trivia. They did Disney attraction charades. Simply outstanding. It was one of the best cast member/guest interactions I'd seen in a long time. There was a young girl who had obviously lost her hair to an illness and to see her beaming face as the cast members entertained her was worth the two hour wait alone. Everyone cheered as the ride came back online and off we went. Slinky is a total blast. We were all consistently laughing so hard, especially over the series of camel humps. They gave us a free universal experience FastPass for waiting in line so long and as soon as we got off Slinky and were confident that it was still up and running, we went right back on and used that FastPass immediately. That should tell you something. 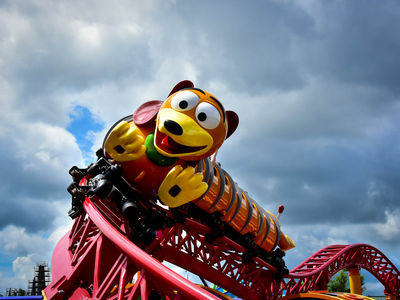 Slinky Dog Dash is a new must do ride in this author's opinion and I'm pretty sure my crew of six or seven family and friends would concur. Toy Story Land looks very cool. There's a ton of details to look for and I think they did a wonderful job really transforming the area into what it's supposed to be, Andy's backyard full of toys. It's not a pretty land though, if you know what I mean. It looks pretty cluttered and haphazard, as any little boy's backyard play area would be. But, at night, something beautiful happens. Rex helps with the classic Christmas lights which transform Andy's back yard at night. Photo by Bonnie Fink. The classic Christmas lights that Andy has strung all over his yard come to life and the whole place changes. Personally, I've always been a fan of the big colored Christmas lights represented here in Toy Story Land. I think they give off a beautiful glow and they remind me of my childhood in a big way. I was so thrilled to see that they chose those kinds of lights for Toy Story Land. You definitely get the sense that Andy went into the garage and pulled out an old cardboard box full of his family's Christmas lights to light up his land of make believe. The results are pretty darn impressive. It looks amazing at night! We were there on an extra magic hours night when the park was open until 12:30 a.m. Most of the crowds had gone by midnight and we were walking around the land checking out the ride queues and details with those colored lights shining bright. It was a whole different place. I highly recommend seeing it at night, preferably with fewer crowds if that's possible. You won't be disappointed. There's been a lot said about Toy Story Land. It seems to be a little polarizing. I've heard complaints that it's too hot. There's no place to go inside at all. No inside eatery. Shockingly, no inside gift shop. I can't disagree with all that. Most of the queues, aside from the bulk of Toy Story Mania, are essentially out in the open. The only place to eat is the aforementioned lunch box and that's completely outside exposed to the Florida elements. That may be a problem they want to address in the future. Let's remember that this newest of Disney lands has only been open for about a month and a half now. It's in its infancy and I'm sure kinks will be worked out, especially as the nearby massive construction of Star Wars: Galaxy's Edge slowly heads towards completion in about a year or so. Once Star Wars nears completion, there may be room for tweaks to its neighbor. One thing that I will disagree with is some complaints that Toy Story Land is not immersive enough of a land. Most of those complaints, in my opinion, are stemming from the fact that Toy Story was the next land to open after the massive and completely immersive Pandora over in Animal Kingdom. Is Toy Story Land as immersive as that? Of course not. Should it be? Of course not! Not every land is going to be Pandora or Galaxy's Edge, and they shouldn't be. Toy Story Land is meant to be a particular thing. If a little boy named Andy built a play land for his toys to play in, what would it look like? It would more than likely look like what Toy Story Land looks like. I think they did a wonderful job capturing the imagination of a little boy transforming his backyard into a world for his invited toys (that's supposed to be us, the guests) to play in. I actually wish it was a little larger, but who knows? Toy Story's popularity as a franchise never seems to diminish so could we see expansions and additions to Toy Story Land in the future? One would hope so. Until then, go check it out for yourself. Take a picture of yourself next to the giant Pixar ball. Seek out the details in the dining area of Woody's Lunch Box. Stand next to giant Cootie bugs! I played with Cootie. My kids played with Cootie. I'm guessing their kids will play with Cootie. There are green army men everywhere. The height requirement stands are Candyland playing pieces. Slinky Dog Dash is a ton of fun. Toy Story Mania is an already established classic made even better now with multiple tracks and an even more developed queue. If you like Toy Story or, dare I say, if you liked being a kid, then you should have plenty of fun in Toy Story Land. The one omission you may notice in this article is the Alien Swirling Saucers attraction. In full disclosure, I have to say we never got on it, and I'm not too sure why. Nobody in our group seemed really enthused about it. It looks kind of fun. People were definitely on it having a good time. It seemed to elicit the same feelings I get about the teacups in the Magic Kingdom. When I'm on them, I'm laughing and having a good time. I just don't want to put the effort into waiting for them. Maybe I'm missing something. It is cool looking. I loved watching it and listening to the "alien-ized" Toy Story music playing. I just didn't want to put the effort into trying them out. Not with two excellent attractions in the same land. Maybe next time. One more thing has to be mentioned. If you think you're excited for Star Wars: Galaxy's Edge now...hop on Slinky Dog Dash and when you hit that peak take a gander over the construction walls at the progress so far. Everyone's reaction in our crew was the same. As if the ride wasn't fun enough, the view of what's headed down the pike for us Star Wars fans is pretty unbelievable! Thanks for taking this journey with me through Disney's Hollywood Studios, a place where I'm quite sure I'm going to be spending even more and more time as the years go on. As always, I'd like to hear what you have to say. Click on the link below and share your thoughts on this list and I'll see you next time with another Disney Top 5 as I finally cap off the tour of all 4 Disney theme parks by dipping back into Animal Kingdom for a deeper look at Pandora – The World of Avatar. At long last, I've seen all that amazing land has to offer and I have a lot to say! I almost wish you didn't read this because being happily surprised was a big part of the fun! 50 is a state of mind! There were several 50+ year-olds with me on that Slinky ride laughing and screaming like little kids! Have a great time in October and thanks for the kind words.